The terms ‘belief’ and ‘meaning’ have long been used to describe important elements of the experience of cancer for patients and their families. In a time when the demands of treatment and the fear of recurrence and death are at the core of the patient's experience, exploring and working with beliefs and meanings is an essential part of helping people adapt to diagnosis and treatment. Despite the importance of these concepts for theory, research and practice, there seems to be stone overlap in the definitions of belief and meaning. At times, the two terms are linked as successive elements of adjustment. For example, in the model of family adjustment and adaptation response, Patterson (1988) describes global meanings shared by family members as a global orientation or pattern of responses, which is based on assumptions and beliefs. Janoff-Bulman (1989) also refers to the meaningfulness of the world as the result of peoples' beliefs about the extent to which good vs. bad outcomes occur. Others do not make a distinction between the terms and use them as synonyms of a larger construct (Wright et al. 1996). In the last decade, the effect of beliefs on individual and family experiences of illness has been a significant focus of study. Many studies have described the impact of shared beliefs in the family on health outcomes (Rolland 1987, Harkaway & Marlsen 1989, Patterson & Garwick 1994, Duhamel 1995, Wolpert & March 1995, Wright et al. 1996. Moules 1998, Wright & Leahey 2000), the role of individual beliefs in determining health-seeking behaviours (Jennings 1996, 1997, Sheikh & Ogden 1998), the importaece of beliefs about cancer pain (Dar et al. 1992), and the impact of education programs on beliefs about cancer (Barnes & Thomas 1990). 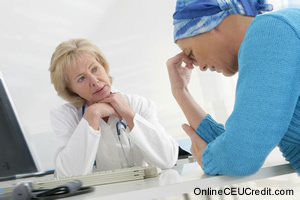 Researchers have also focused on the need to create new meanings among cancer patients (Taylor et al. 1964, Mahon et al, 1990, O'Connor et al. 1990, Thompson & Pitts 1993, Dirksen 1995. Donnelly 1995, Germino et al. 1995, Haberman 1995, O'Connor & Wicker 1995. Taylor 1995). Others have described the effect of uncertainty in the construction of meaning for illness events (Mishel 1988, Nelson 1996), the influence of meaning on coping strategies (Luker et al. 1996) and the influence of culture on the search for meaning (Bruner 1990, McGrath 1998). Taylor (1983) has theorized that finding positive meaning in life events allows individuals to view their situation in self-enhancing ways, thereby promoting adaptation. In their recent works, expert clinicians describe the concept of beliefs as central to understanding and working with both individuals and families (Wright et al. 1996, Walsh 1998). This idea is not new to clinical practice. Challenging dysfunctional beliefs and enhancing facilitative beliefs has long been at the core of cognitive restructuring therapies (Beck 1995, Ellis 1996). The term ‘meaning’ is used to describe a central idea in a number of coping theories that are relevant for nursing practice (Taylor 1983, Lazarus & Folkman 1984, Moos 1988, Patterson 1988, Rolland 1994). The search for meaning in an event like cancer has been found to help the adaptation process in persons with recurrent cancer (Taylor 1995), women with breast cancer (Taylor et al. 1984) and in bone marrow transplant patients (Sleeves 1992, Haberman 1995). For Cassell (1982) it is impossible to understand illness and suffering without taking meaning in consideration. O'Connor et al. (1990) in their efforts to understand the cancer patient's search for meaning, defined it as questions aimed at giving the experience purpose and placing it in the context of a total life pattern. They considered this integration to involve the reworking and redefining of past meanings while at the same time, looking for meaning in the current life situation. In summary, an analysis of the use of these terms and of the phenomena they reflect suggests the importance of understanding the concepts of belief and meaning particularly in the experience of living with cancer. In an adaptation of the methodology of Walker and Avant (1995), this analysis will provide a theoretical basis for distinguishing between the two concepts, and for differentiating between two types of meaning. It is argued that this distinction will help researchers achieve greater clarity in their operational definitions of the concepts and will guide practitioners in making more focused interventions in the clinical setting. According to Webster (1993), a belief is the conviction that something is true. Sociologists consider that beliefs are a set of related ideas that are learned, shared and persist over some period of time. In order for individuals and families to remain committed to their beliefs, the belief system must be supported by a larger social context (Borhek & Curtis 1975). Taggart (1994) suggests that although beliefs are ranted in reality, they are also shaped by human imagination. He places beliefs at the heart of the person's identity, and their understanding at the centre of reality. The beliefs that individuals or families hold about an illness determine in large part how they will cope (Taylor 1983, Janoff-Bulman 1989, Wright et al. 1996). At the same time, illness often challenges or threatens existing beliefs. In their work on stress and coping, Lazarus and Folkman (1984) describe beliefs as part of the personal factors that influence appraisal. Family coping theorists also suggest that values and beliefs influence family coping (Rolland 1987, Boss 1988), and family adjustment and adaptation responses (Patterson 1988). Through language, the family develops an implicit and shared set of assumptions and meanings, also called beliefs, about themselves in relation to each other and about their family in relation to the community and the systems beyond (Patterson 1988). Clinicians have worked with individual beliefs in the context of a therapeutic relationship. Cognitive therapies (Meichenbaum 1977, Beck 1995, Ellis 1996) view emotional suffering as a result of the way in which people construe the world. According to this view, when faced with adversity, individuals create both rational and irrational beliefs that will have a direct impact on their emotions. The premise behind the theory is that there is a circular relationship between emotions, behaviours and a person's interpretation of an illness event. Beliefs about oneself, other people and the world develop from childhood and are at the centre of the interpretation of the event. Core beliefs, the most fundamental level of beliefs, have been described as global, rigid and are often over-generalized (Beck 1995). Intermediate beliefs are influenced by the core beliefs and consist of attitudes, rules and assumptions. The role of the clinician is to increase awareness of negative self-statements and images (irrational beliefs), and to assist individuals to focus on learning specific problem-solving and coping skills in order to develop a set of new beliefs about themselves as competent and resilient (Beck 1995). In their discussion of interventions with individuals and families dealing with illness, Wright et al. (1996) also describe their work with constraining and facilitative beliefs as core beliefs that decrease or increase solution options. They have placed the concept of belief at the centre of nursing practice, but do not make a distinction between meaning and beliefs. Rather, they use the term belief to refer to a larger construct that incorporates both dimensions. In their view, beliefs are defined as fundamental ideas, opinions and assumptions held by individuals and families, both conscious and unconscious, that determine the individual's progress through life. Dictionary definitions of meaning do not adequately reflect the complexity of the concept, as it has developed in theory and in clinical practice. In literature, the concept of meaning has been presented from two main perspectives: existential meaning, as it is related to the individual's perception of his place within the world and situational meaning, which is related to how, individuals evaluate specific events. In his classic work, Frankl (1984) described the search for meaning as a primary motivational force, unique and specific to each individual. Suffering triggers a search for meaning in which victims have a powerful need to make sense of their lives. Similarly, Yalom (1980) refers to the search for meaning as a search for coherence and purpose in life. According to Marris (1974), meaning is learned through social interactions and is linked to identity. It provides a frame of reference that helps individuals to provide a justification for their own behaviour, Koestenbaum (1976) made a distinction between meaning of life and meaning in life. He describes these as two dimensions of the cosmic world in which a person lives. The former refers to the individual realm of a person's life and the latter emphasizes humanity and the temporal and fragile aspect of individual existence. Thompson and Janigian (1988) proposed a framework for understanding the search for meaning based on cognitive representations called life schemes, which provide a sense of order and purpose in one's life. A life scheme is based on the views that individuals hold about themselves, and on their set of philosophical or theological beliefs and assumptions about how the world operates or their worldview. Finding meaning is a process of changing the life schemes, so that feelings of order and purpose are restored. They defined ‘found meaning’ as the result of the search for meaning in the experience, similar to Frankl and Yalom's conceptualization of meaning. Patterson (1993) has extended these ideas about life views that are held by individuals and has described the concept of global meaning as a shared set of meanings that family members hold about themselves in relation to each other, and to the community and systems beyond. These shared meanings determine the family's cognitive representation of itself, and are also called the family schema. In contrast to the global, existential views of meaning, theory of stress, appraisal and coping by Lazarus and Folkman (1984) focused on the appraisal of a specific stressful event or situation. They described appraisal as two simultaneously occurring processes. In primary appraisal the individual evaluates the situation as benign, as a potential threat or as a challenge. In secondary appraisal, the individual evaluates the personal or external resources available to deal with the situation. In their framework, Thompson and Janigian (1988) made a distinction between implicit meaning and the search for meaning. Although their focus was on the life schemes and the search for meaning, they also identified ‘implicit meaning’ as the personal significance attached to a negative event that evokes a special set of problems and emotions that affect the adjustment process. This definition is similar to Lazarus and Folkman's use of cognitive appraisal. In their framework, they have brought together existential meaning and situational meaning as different but related processes that determine how people understand and handle current stresses as well as how they see the world. Family theorists (Patterson 1993, McCubbin & Thompson 1994) have attempted to integrate this dual conceptualization of meaning into their models of adaptation. They consider that the family's situational appraisal is formed from the perceived relationship between their resources and the demands of the situation. This family appraisal of the crisis situation interacts with the family's schema, that is their values, goals, priorities and rules, to achieve congruency and ultimately influence their adaptation to a crisis situation. In her conceptualization of meaning, Fife (1994) also looked at two dimensions of meaning: self-meaning and contextual meaning. Self-meaning is the perceived effect of the event on the individual's identity and contextual meaning refers to the perceived characteristics of the event and the social circumstances around it. Her concept of meaning attempts to combine the two dimensions of existential and situational meanings into a single, larger construct. In summary, our concept review suggests that the terms beliefs and meaning refer to three different but related phenomana: personal beliefs; existential meaning and situational meaning. The preceding section contained information regarding beliefs and meanings related to the cancer experience. Write three case study examples regarding how you might use the content of this section in your practice. A life schema is based on what three components? Record the letter of the correct answer the CEU Answer Booklet.